All right! It’s time to get ready for the 2018 Summit Racing EDRS Series Drag Finals at Gardermoen Raceway. This weekend is where this year’s class winners will be decided. This is the situation in points in the 2018 Summit Racing EDRS Series before going into the Drag Finals at Gardermoen Dragway next weekend. There is going to be some tight races and intense point chases among the 180 teams from at least four countries who are registered to enter. 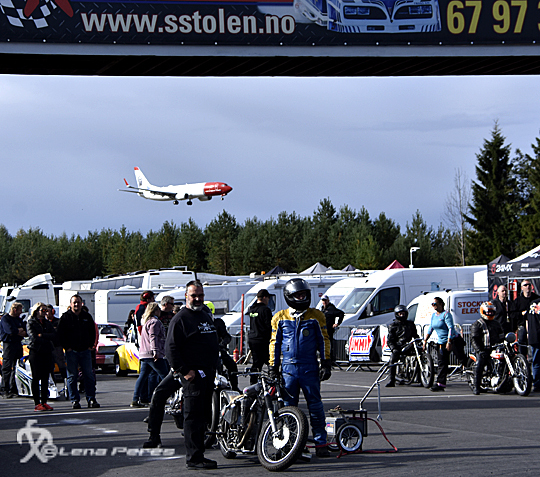 If you have the opportunity, take the trip to the best drag strip in Norway. Competition Eliminator – Current leader Jens Eklund is at a safe distance from the #2 Gideon Liljegren and wins the class this year. Stock/Super Stock – Only two entries in the class for the Drag Finals, one of them is Theodore Brandt, who is currently #4 in the points. He only needs to qualify to be the 2018 champion. Pro Street – Here we have two combatants who have been fighting it out all season. Lars Berglund is in charge but is chased by Daniel Hållestam, but none of them are entered to the finals so the series win goes to Lars. Congratulations. Street – Rolf Berglund, the King of Street, has a solid lead this year as well. However, there’s a tough fight for second place. Helena Olsson has 398 points, but Marcus Gustafsson is but one single point behind at 397. Angelica Larsson with 384 points will be charging hard. As Marcus is not entered this will be a fight between Helena and Angelica. Super Comp – Mikael Nilsson already the winner in with 653 points but second place is still up for grabs. Mari Udtian is currently in second place with 500 points, Elin Aarvik in third with 463 points and Siri Johansen at 396. All these girls are sharp on the tree, so it will be a tough fight for the points here. Super Gas – Håkan Mattsson owns the win in the series with his 619 points. Christer Uhlin in second place with 484 points is only 19 points ahead of Patrick Wickman and Annica Larsson 5 points behind Patrick. It will be a hard fight for the runner-up spot in this class. Super Street – Here we have a real tough battle between Isak Lagg and Ulf Lundgren. They are sharing the lead with 621 points each. Uffe has been in the game for many years and would very much like to bring this win home, but newcomer Isak has made an impressive career. This is his first season in the sport and will of course do his best to take home the championship. Jr Dragster – It’s a tight battle in the North Division. The top three in points will be racing here and they all have a chance to win the series this weekend. Wilma Andersson is at the top of 540 points with Fanny Andersson just 9 points behind, 531 points. Pontus Söderlund is in third place and is all psyched up to bring home the trophy this year. In Central Division, Tomas Nurmien from Finland now has the lead before Kerttu Lehtonen but only by 37 points. However, none of those drivers are entered for the Drag Finals. Super Pro ET – Björn Hultberg leads with 540 points but is chased by Stefan Jansson who would like to take the series win. Stefan has 475 points with Lucas Karlsson close behind with 463 points. Everything can happen in this class this weekend, nothing is decided yet. Pro ET – Anders Edin is in the lead in the North division with 455 points, just ahead of Linnea Malmbergs 430 points. Thomas Olsson in third place with 420 points but so far, we can’t see any of those in the entry list. In Central Division, Richard Falkenberg is at the top of the list and will be on site. He has 442 points and behind him is Niklas Wikander at 388 point. Jonas Larsson is in third place with 385 points. Super Street Bike – Mathias Bohlin is untouchable with his 586 points, neither he nor any of the others who are in the top-5 are entered for the Drag Finals. Anders Blanck in the #6 spot is entered, he can improve his position but has no chance for a top position. Super Comp Bike – Tomas Jonsson is already the winner of the Summit Racing EDRS Series and is not showing up for the Drag Finals at Gardermoen. Peter Östlund who right now is in 5th place will be there and will most likely improve at least one position. Super Gas Bike – Jani Oksanen in the lead and will be on site to defend his points. This also applies to Ellen Ödegaard who is in second place with 414 points against Jamis 451. The Drag Finals weekend will decide the championship. Jr Dragbike – #1 and #2, Eemeli Helkalla and Milo Ahonen, will not be race this weekend. However, Tryggve Kjärstad, number 3 in points will be there. He has the opportunity to get enough points and bring home the whole championship win. Tight racing is the way to go.